By executing continuous, automatic investing you will be doing what the market calls “Dollar Cost Averaging” Here is how it works. Investor puts X dollars per period (week, month, year) into a stock. If the price of the stock is higher than previous period, investor gets fewer shares for X dollars. If the price of the stock is lower than previous month, investor gets more shares for X dollars. 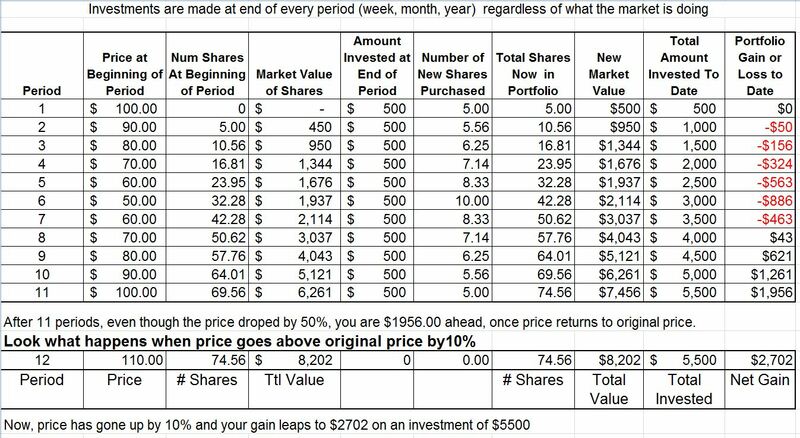 In the example below, $500 is invested in each period (week, month, year) even though the market is falling. Of course it’s much easier to invest when the market is rising. Click on image to enlarge it and then spend 20 minutes studying it! It is Dollar Cost Averaging that makes the strategy work. You must internalize this concept and make it work for you. During your accumulation phase, NEVER, EVER fail to make a purchase because the market is in free fall. You know the market will recover. This is your opportunity to make purchases at bargain basement prices. This is how you Buy Low and Sell High. During your accumulation phase, NEVER EVER sell a single share of VTI. If you do, you would be Selling Low. Later after the market recovers you would be Buying High – just like most other investors. Swear to us now, that you understand and will utilize the bedrock, keystone principle of the plan – Dollar Cost Averaging. If you decide to sell when the market is falling, what decision criteria do you use to know when to buy back in? Oh… wait until the market goes back up past where you sold? Isn’t that Selling Low and Buying High? Yes it is. you have just fallen into the trap that dooms the uneducated investor.